Davao City Mayor in today’s edition of “Gikan sa Masa Para sa Masa” TV program has advised Congress that while “going federal is the only way to have peace ” Moro National Liberation Front leader Nur Misuari must not be forgotten in the present deliberations on the draft Bangsamoro Basic Law. “Don’t forget Misuari. For all his faults, he is a man to reckon with. If Misuari is not included to whom will he talk with? It’s Abu Sayyaf. We’ll first set aside the Zamboanga seige,” Duterte said. Misuari might make the Tripoli Agreement to question the BBL, pose new problem, and “all others might be affected” which would give difficulties to BBL in striking peace in Mindanao, the mayor opined. In stressing his long-standing position of having a federal type of government, the mayor said that things could still go awry without Misuari being included even if the BBL is approved by Congress. Duterte said the peace formula for Misuari and the Moro people living in the country’s West, referring to Zamboanga penisula-Jolo-Sulu-Tawitawi areas where the MNLF has stronghold, is also to give them a a nation or a state under the federal system of government’s configurations. In his various talks with the Muslims, he said he kept on telling them that they could “no longer take back their land that have been taken, and instead we offer a nation, a Bangsamoro” carved out within the country’s territory. The federal type of government is “the only way to peace”, which can reconfigure the country into states such that various Moro peoples would be given the freedom to fully govern themselves with least central government intervention. The mayor, however, stressed that he fully supports the BBL and hoped that it will become binding and legal. Senator Franklin Drilon told him recently that due to limited time the BBL would he passed by the Congress without the charter change, Duterte informed. “I am confident that under the prodding of President PNoy it will be passed into law,” he said. 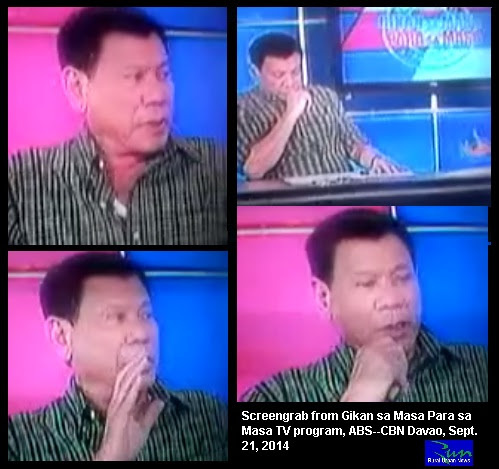 In the same TV program, the mayor again said he is not interested to run for President in 2016. This entry was posted on March 20, 2016 at 12:30 am and is filed under digong with tags digong. You can follow any responses to this entry through the RSS 2.0 feed. You can leave a response, or trackback from your own site.